One of my favorite things in the world is coffee. So it’s no surprise that I love using it in any recipe I can get away with, like this Slow Cooked Roast recipe. I’m sure you’ve tried the typical liquids used to slow cook a roast such as: water, broth, beer, and wine, just to name a few. Are you ready to try something different? If the answer is yes, you’ve come to the right place! Although I’d like to take credit for coming up with this idea, I can’t. The credit goes to my sister-in-law, Alison, who is responsible for giving me this idea. Alison is an amazing cook, and together, we’ve had a great time tearing it up in the kitchen. Ever so often, Alison comes over, and we each pick a few dishes to cook, rounding off a fantastic meal! With my own sisters being far away, it’s nice having a sister-in-law like Alison to share the joy of cooking with. I love serving with this Slow Cooked Roast with baked potatoes and steamed broccoli. However, potato salad and my Low Carb Brussel Sprouts recipe would also be perfect side options. Although I’m not much of a gravy person, I know a lot of you are. If you do want to make gravy, try thickening the juices rendered with a bit of cornstarch. Although I haven’t tried that myself, there is a possibility that the gravy can taste slightly bitter. This can be as a result of the coffee used to simmer the roast in. Next time you’re planning on making a roast for dinner, give this recipe a try. If you’re a coffee lover, like I am, I shouldn’t have to twist your arm too hard. 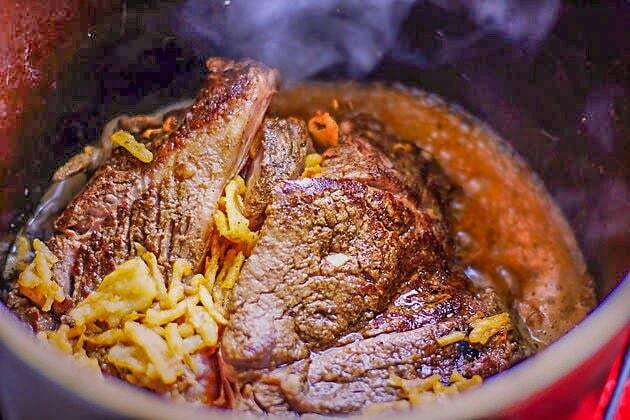 I love using my Dazey Chefs Pot/Deep Fryer for cooking this roast. It’s the perfect size for the job, although they may no longer be available. 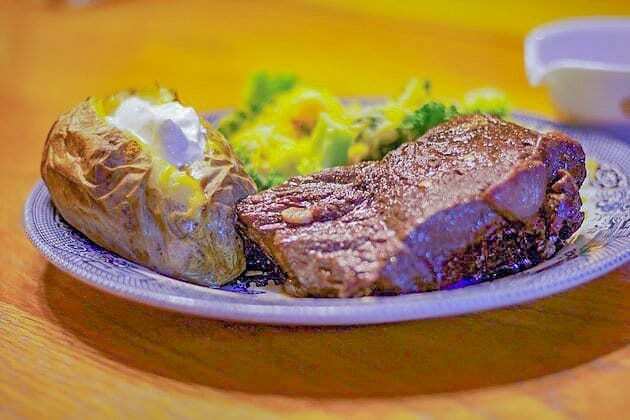 If you love coffee, you'll love this tender, coffee-simmered roast! Make slits all over the pot roast, and fill the slits with slivers of garlic. Mix salt, pepper, cloves, and allspice, and rub all over the roast. Heat oil in a Dazey Chef's Pot (if you are lucky enough to own one). Alternately, you can use a Dutch oven. Sear the roast on all sides, until nicely browned. Sprinkle the roast with the fried onions, then bathe in coffee... not you, the roast! Cook on low or 200 degrees F for approximately 3 hours.